Experienced outdoor camping cooks know that carrying heavy boxes and coolers of camp food in and out of camp is not fun. They also know they miss a lot of the outdoor camping experiences they came for when they are stuck preparing and cooking campfire meals. But the job can be made easier and less time consuming. These smart camping cooking tips will show you how to reduce the bulk and weight of your supplies, and get out of the camp kitchen sooner. Ziploc freezer bags are an indispensable part of a smart camp cook's supplies. They pay tribute to this product every time they pack the food for a weekend of outdoor camping. "Never take a box or can when a Ziploc will do!" is a motto a smart camp cook lives by. Your cooking supplies should include three types of Ziplocs: one box of sandwich bags, and one each of gallon and quart size freezer bags. Not only will they save weight and space, they will also reduce the amount of trash you have to carry back out of camp. Start with your campfire recipes. If there is any ingredient prep that you can at home, do it, and put the results in a Ziploc freezer bag. You will save time if you don't wait to do it at camp. This will also save a lot of weight and space, Ziplocs weigh less, and take-up less space than individual cans and boxes. Be aggressive with this, camp meal prep you do at home, will add to the time you have for the outdoor camping activities you came for. After the prep work, take a look at the rest of your boxed or canned food items. Look for anything that can be put in a Ziploc instead. That can of soup, or box of pancake mix will travel just as well in a Ziploc, allowing you to lose the extra weight and residual trash. Also consider ingredient quantities, no need to take a five pound package if you will only use one pound. Just put what you will need in a Ziploc and leave the rest home. And don't forget the simple stuff like salt & pepper, and spices. You will not use whole containers of these for your camp meals, so take what you need in sandwich baggies and leave the containers home. Ziploc freezer bags also work for cold food items. Look at the cold food items with the same objectives as you did with your dry foods. If it can come out of a bulky carton or container and into a Ziploc, do it. You will be surprised how all those little individual weight and space savings add-up to substantial reductions. 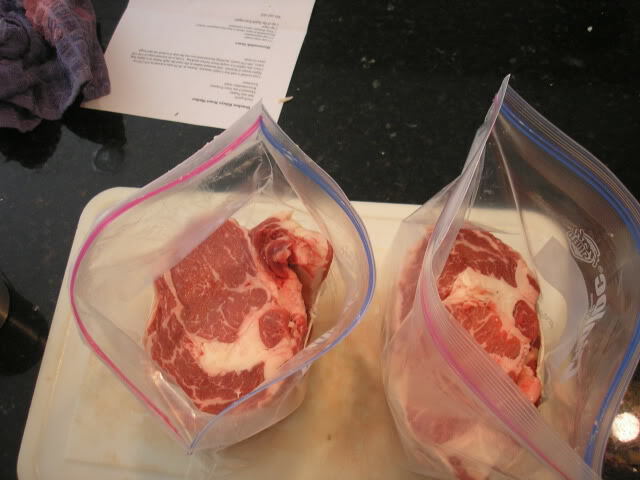 Ice is a big part of the weight and bulk of your camp coolers, Ziplocs can help here too. Take a look at the camp food items in the cooler, freeze everything you can, even your meats. If it's not for your first camp meal, freeze it, they will be safe in their Ziplocs, (remember to only use the stronger double-sealed freezer bags), and will act as ice packs, reducing the amount of ice you will need to carry. And don't worry, in a camp cooler they will thaw by the time you need to use them. 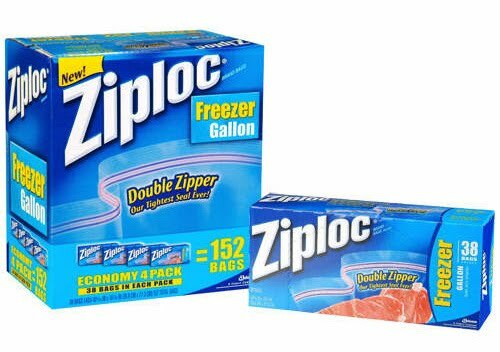 Once you start using Ziplocs for your camp food and campfire recipe ingredients, you'll wonder how you ever camped without them. And the freezer bags are much safer and sturdier than the thin sandwich bags, so don't be timid about what you put in them. So challenge yourself, how much weight and bulk can you leave at home? Here is a good illustrated article that reviews and prices some of Lodge's best cast iron pieces if you need to add to your camping cast iron cookware. GA Anderson is an online author and avid outdoors man whose lifelong camping adventures include over 7 years camping experience as an adult leader with the Boy Scouts of America. 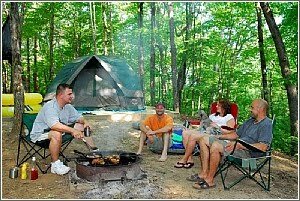 To see more outdoor camping, and campfire cooking articles visit his Hiking & Camping articles. I see that this is an old post, so not sure if it's still being monitored ... I'm wondering how long things will stay cold/safe to eat if they are frozen. Things like meat, for example. You can use a gallon jug to help keep things cold. Take 1/4 cup salt fill gallon jug 3/4 full of water add salt and freeze. This will stay frozen longer and keep your cooler cold. I know this is an old post, but someone might stumble upon it. :) I took my family of 6 on a nine day 12 state camping trip. I prepped EVERYTHING at home. Cooked all the meat, cut the food, prepackaged it in individual bags, etc. I did this for breakfast lunch and dinner (I'm a planner, so I had a list with a daily schedule of what we were eating, when and where). I then froze EVERYTHING except the first night's dinner and first morning breakfast. I packed everything in our 96 gallon "freezer" cooler in order they were to be eaten (the last meals were at the bottom and I worked my way up backward). In the morning I'd pull out that night's dinner meal and put it in our "refrigerator cooler" (this was just a smaller cooler for keeping some things cool so we weren't opening and closing the freezer cooler all day). By the night it was thawed just enough to cook and/or heat up. I had a tub I kept all our dry food in. At the end of our nine day trip, our last meal was just thawed, but still cooler than refrigerator cool. I used gallon and half gallon jugs of frozen water as ice. We added two bags of ice in the freezer cooler on day 6 because I was afraid some items on top were getting too warm (like our omelets and mayonnaise, etc.) Everything was perfect. I continue to pack like this for all our camping trips. It makes life easier. The best thing I ever learned was to put one egg in a small ziplock bag with whatever ingredients you want in an omelet, mix it up, freeze it, and then toss it in a pot of boiling water when you're ready for breakfast. My kids LOVED it and it was premade and SOOOO simple to cook. Kathryn thanks for the tip. I think I'm going to try the egg omelets for breakfast and not worry about carrying the eggs!